A low growing shrub than copes with heat and dry conditions Tanacetum densum ssp. amanum also hase wonderful silver grey foliage. It is almost prostrate and can be used a ground cover plant in those hot dry difficult positions. The foliage is the main attraction, and with small yellow flowers held above the foliage it provides year round interest. If you have a large dry area, this will make an outstanding easy care ground cover if planted correctly. This is a very low care plant once established. It does require a very well drained soil and full sun. Choose a hot dry position and it will thrive. 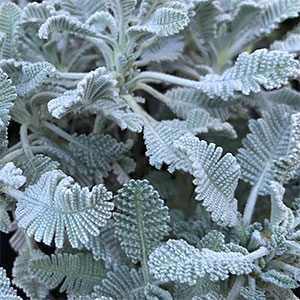 The foliage is wooly and it is best to plant Tanacetum densum ssp. amanum in a position where the foliage will not be sitting on wet or damp soil. A position in a rich garden is perfect, or mulch around the plant with gravel or pebbles. When first planted, water in with a liquid seaweed fertiliser, once established only water during very long hot dry periods, and then water deeply rather than often. You can deadhead after flowing with some hedging shears to keep the plant looking tidy. This is an evergreen plant and does not require heavy pruning. Flowers – Small yellow button like flowers.